Check out ISU’s campanile playing “Royals” by Lorde. So fun. Last week, as many of you may have heard, VEISHEA was cancelled. It was definitely a bummer, but that didn’t stop ISU from celebrating our school spirit throughout the week! “Royals” was only one of many different songs (“Let It Go” from the movie Frozen was also played, it was sweet) played last week on the campanile at noon, while hundreds of students gathered on Central Campus for a big picnic. 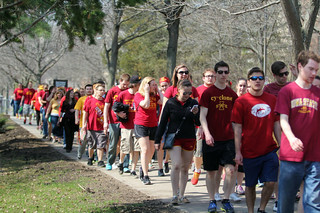 Adam Guenther, a senior at ISU, organized the Campus Showcase Parade, in which over 100 students marched around campus showing their Cyclone Pride. This picture is courtesy of Blake Lanser at the Iowa State Daily. Also happening this past week, Iowa State’s premier honor society, Cardinal Key, had their annual initiation ceremony. 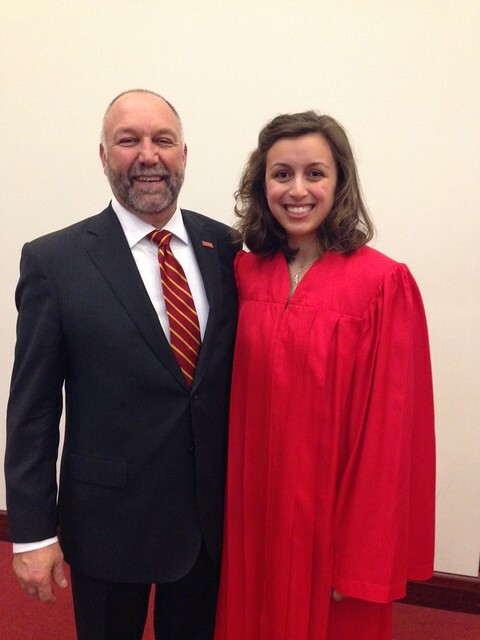 I was super proud to be on the executive team that ran the event, and I even got a picture with President Leath! It was a great event, we initiated 63 members into the society, and each and every one of them had some great accomplishments under their belt. All in all, it was a great week. I love being a Cyclone. Even through our campus’s ups and downs, we have a strong, proud spirit. Not to mention our amazing student leaders that make our community a truly great one. So long, farewell, auf wiedersehen, good bye!